Scarecrows have been known at least as long ago as ancient Egypt. In some cultures, people were sent to the fields to keep away the pests. The Creek Indians did this in America. Before modern times, the English would also send out the very young and the very old to their fields with noisemakers. All people rely on a good harvest to last them through the winter, and scarecrows, human or straw, help them to have one. Let's have some fun this harvest time with scarecrow crafts, scarecrow facts, and scarecrow stories. Newbery winner Cynthia Rylant looks into the gentle presence of the scarecrow. Take a trip back to Oz! This story follows the lovable straw man on a quest to overthrow an evil despot who has seized control of a region called Jinxland, along with his sidekicks Cap'n Bill and Trot. One in a long series. 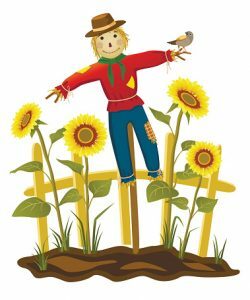 A scarecrow happily dances away from his post one windy night, until a child's prayer teaches him how important he is to the farm. Chicken thinks Scarecrow's hat will make a nice nest, but first she must swap with Badger, Crow, Sheep, Owl, and Donkey. With its repetition and bright pictures, this tale is good for young ones at story time. View Full List for another book, as well as craft and party ideas.